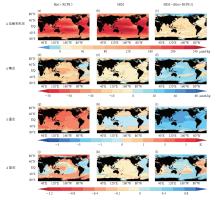 To have a more complete evaluation of the solar geoengineering effect on global climate, it is of great importance to examine the effects of geoengineering on ocean acidification. 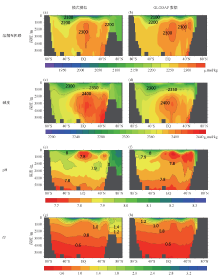 In this study the UVic Earth System Model was used to simulate the effects of solar geoengineering on sea surface pH and aragonite (a metastable form of calcium carbonate) saturation (Ω). 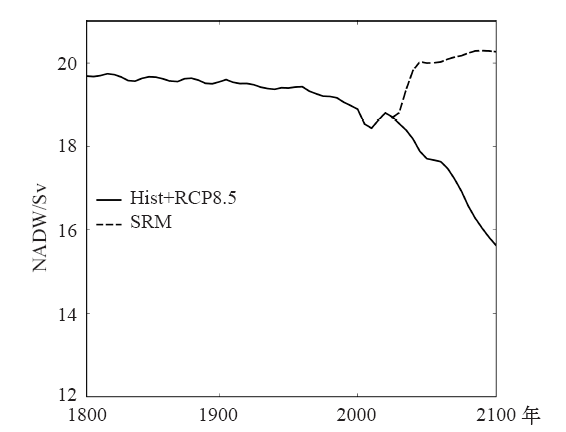 We run the UVic model from pre-industrial to the year 2100 under RCP8.5 scenario, and quantified the effects of individual environment factors on ocean acidification. 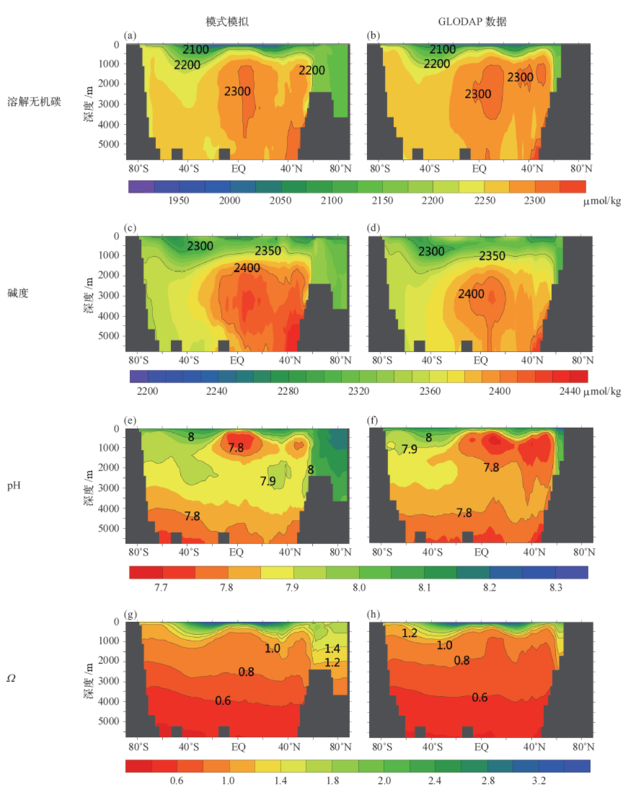 The simulations show that by the year 2100, relative to pre-industrial levels, global mean sea surface pH would decrease by 0.43 and Ω state will decrease by 1.77. 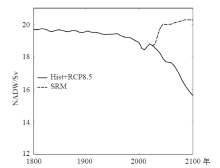 Relative to the RCP8.5 scenario without geoengineering, by the year 2100, solar geoengineering would increase sea surface pH by 0.003, but decrease Ω by 0.16. 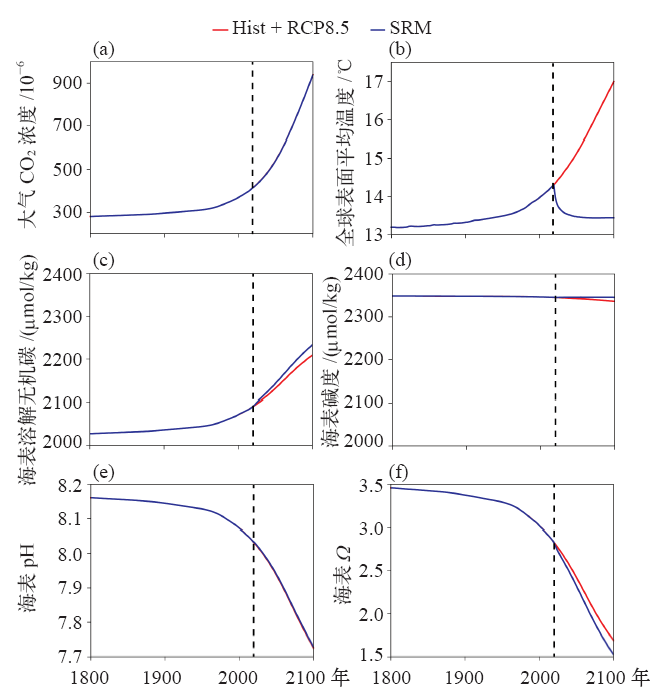 Relative to the RCP8.5 scenario without geoengineering, geoengineering-induced increase of dissolved inorganic carbon would decrease pH and Ω, but the increase of alkalinity would increase pH and Ω. Geoengineering-induced decrease of temperature would increase pH but decrease Ω. The net effect of solar geoengineering on pH and Ω is small. 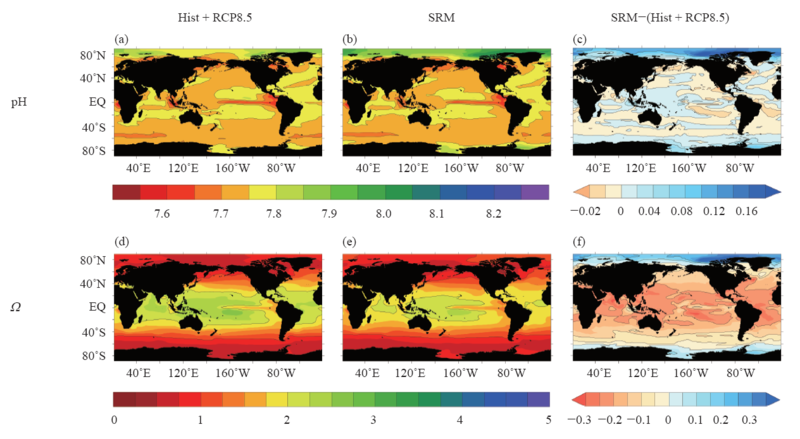 Our study indicates that solar geoengineering could cool the earth but fails to mitigate ocean acidification. 温作龙,姜玖,曹龙. 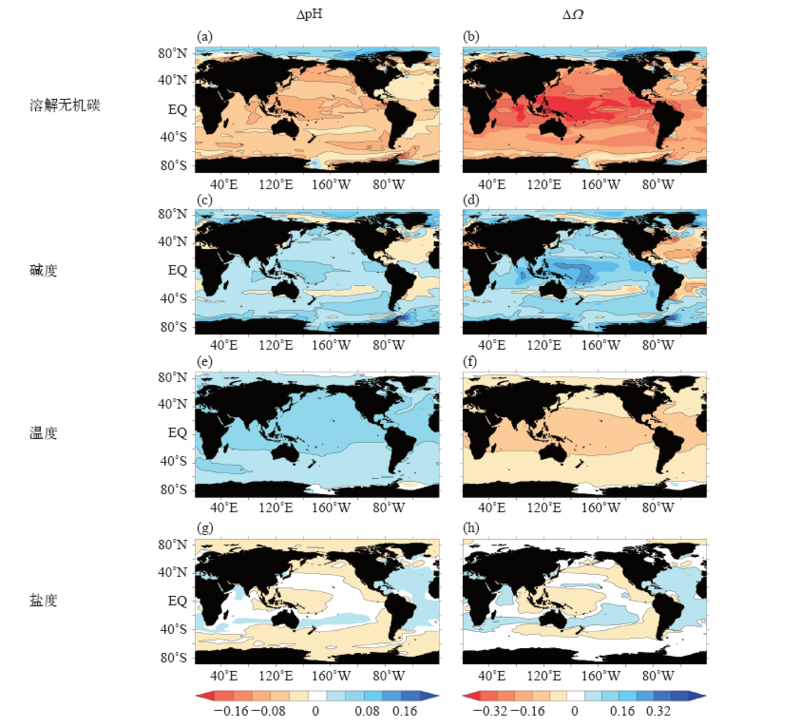 太阳辐射管理地球工程对海洋酸化影响的模拟研究[J]. 气候变化研究进展, 2019, 15(1): 41-53. Zuo-Long WEN,Jiu JIANG,Long CAO. 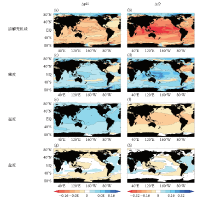 Simulated effects of solar geoengineering on ocean acidification. 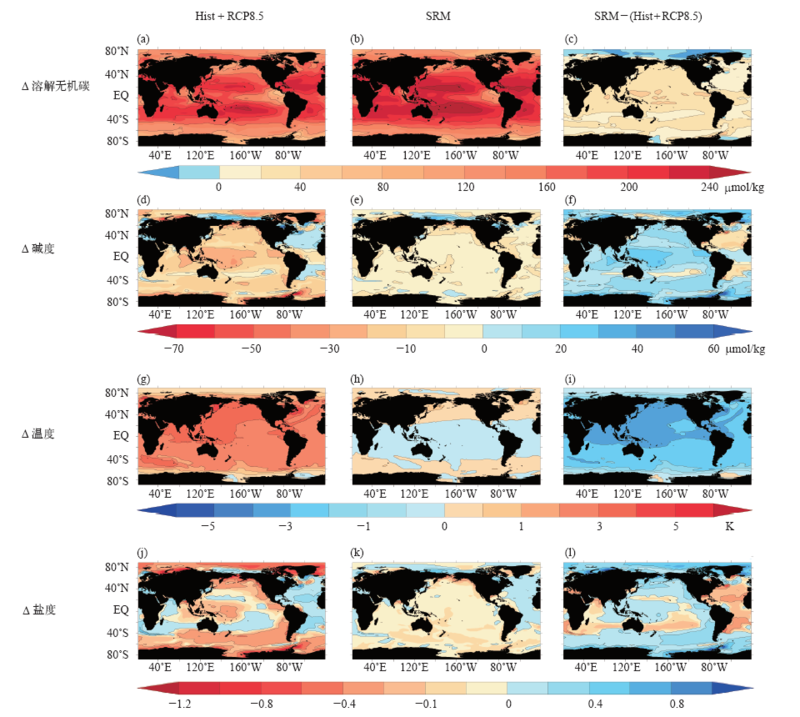 Climate Change Research, 2019, 15(1): 41-53. 陈德亮 秦大河 效存德 苏勃. 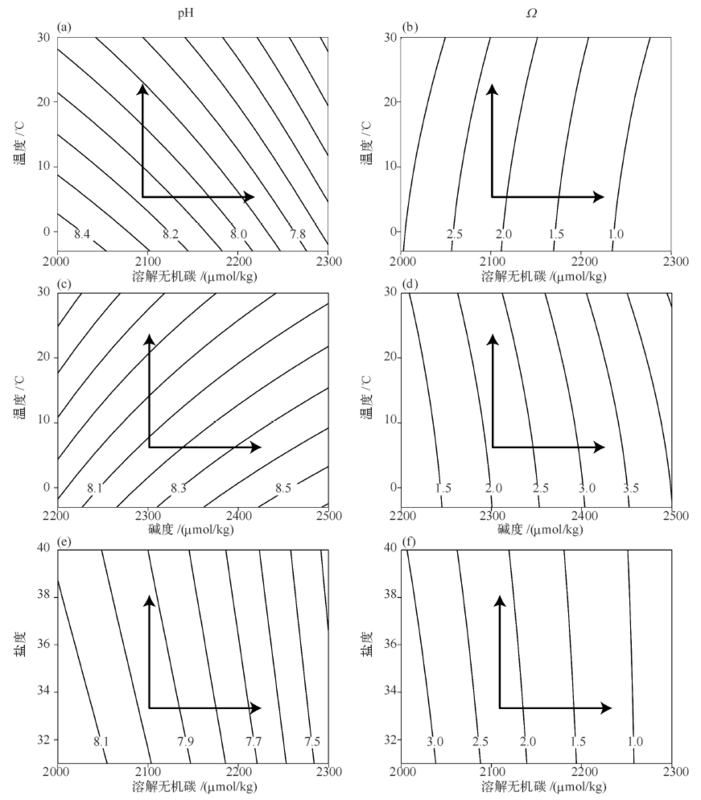 气候恢复力及其在极端天气气候灾害管理中的应用[J]. 气候变化研究进展, 2019, 15(2): 167-177. 章梦杰 郭家力 林伟 郭靖 舒章康 李英海 张静文. 气候变化对水文季节性迁移的影响：以水库汛期分期和极值降水为例[J]. 气候变化研究进展, 2019, 15(2): 158-166. 郭飞燕,綦东菊,周斌,薛允传. 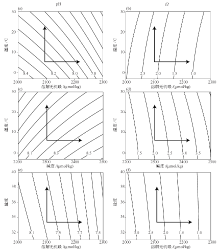 青岛地区气候变化对动物物候变化的影响研究[J]. 气候变化研究进展, 2019, 15(1): 62-73. 洪祎君, 崔惠娟, 王芳, 葛全胜. 基于发展中国家自主贡献文件的资金需求评估[J]. 气候变化研究进展, 2018, 14(6): 621-631. 王利宁, 杨雷, 陈文颖, 单葆国, 张成龙, 尹硕. 国家自主决定贡献的减排力度评价[J]. 气候变化研究进展, 2018, 14(6): 613-620. 范志欣,方修琦,苏筠. 全球碳排放格网化格局的变化[J]. 气候变化研究进展, 2018, 14(5): 505-512. 王正,支蓉,封国林,李淑萍. 典型场选取对多要素气候态相似季节划分的影响[J]. 气候变化研究进展, 2018, 14(4): 350-369. 李宁,白蕤,李玮,张蕾,易克贤,陈淼,陈歆. 未来气候变化背景下我国橡胶树寒害事件的变化特征[J]. 气候变化研究进展, 2018, 14(4): 402-410. 许光清,董小琦. 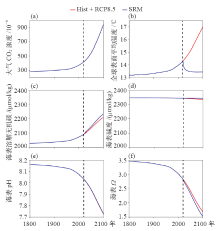 企业气候变化意识及应对措施调查研究[J]. 气候变化研究进展, 2018, 14(4): 429-436. 陈艺丹,蔡闻佳,王灿. 国家自主决定贡献的特征研究[J]. 气候变化研究进展, 2018, 14(3): 295-302. 郑锦涛,陈伏龙,张鑫厚,龙爱华,廖欢. 基于GAMLSS模型的玛纳斯河设计年径流分析[J]. 气候变化研究进展, 2018, 14(3): 257-265. 王胜,许红梅,王德燕,宋阿伟,段春锋,何冬燕. 基于CMIP5模式安徽省植被净初级生产力预估[J]. 气候变化研究进展, 2018, 14(3): 266-274. 艾婉秀,王长科,吕明辉,赵琳. 中国公众对气候变化和气象灾害认知的社会性别差异[J]. 气候变化研究进展, 2018, 14(3): 318-324. 张豪, 谭静, 张建华. 气候变化与城市全要素生产率：理论与实证[J]. 气候变化研究进展, 2018, 14(2): 165-174. 侯志瑞, 陈琼, 周强, 刘峰贵, 马伟东. 青藏高原东北缘山地农户对气候变化的感知及适应策略——以湟水中游为例[J]. 气候变化研究进展, 2018, 14(2): 175-181.